I’m a big believer in slow cooker recipes that use real food ingredients and that require minimal prep. I didn't have dried apples, so I peeled cored, and thinly sliced 1 real apple instead. 1 Stir the onion, applesauce, cranberries, apple rings, honey, cinnamon, apple cider vinegar, and 1 teaspoon salt together in a 6-quart slow cooker. 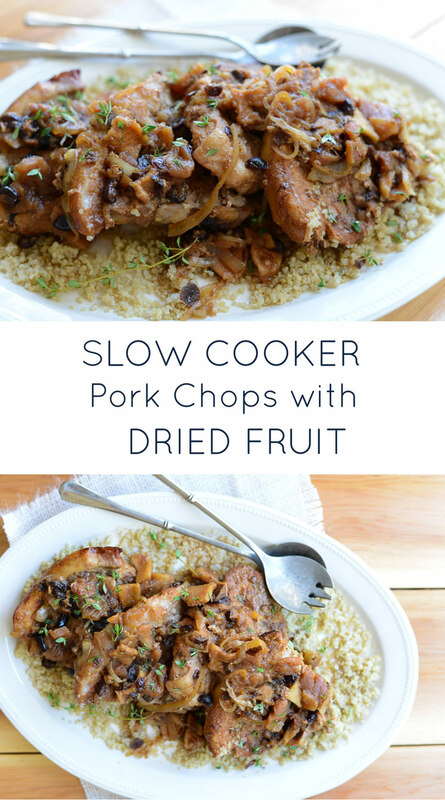 2 Sprinkle the pork chops on both sides with the remaining ½ teaspoon of salt, then nestle them into the slow cooker on top of the onion and dried fruit mixture. 3 Cover and cook on high until the pork is very tender, about 6-8 hours on low or 3-5 hours on high. The total amount of time will vary depending on the thickness of your pork chops. 4 When tender and cooked through, remove the pork chops from the slow cooker to a platter and skim or remove the fat from the surface of the sauce. Taste the sauce and stir in additional salt, pepper or apple cider vinegar to taste. 5 Serve the pork chops warm with the sauce on top or on the side and sprinkled with fresh thyme.